GCI Financial offers new traders a forex bonus of 10%, up to $5,000. This is an instant forex bonus, you can trade with it immediately, but unlike the forex bonuses at other forex brokers, this bonus is non withdrawable. There are no clearing requirements, the bonus is simply not meant to be withdrawn. That's not necessarily a bad thing -because you can still trade with the bonus, but it's good to know in advance. Create an account at GCI Financial through ForexBonusFree.com, make a first deposit and the bonus will be added to your account immediately. 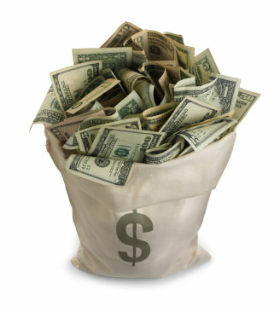 The bonus is a 10% instant deposit bonus, meaning the bonus will be added to your account immediately upon depositing. Please note: this bonus can not be withdrawn. There are no clearing requirements, the bonus is only meant to add trading money to your account. You create an account at GCI Financial and make a first deposit of $2,500. 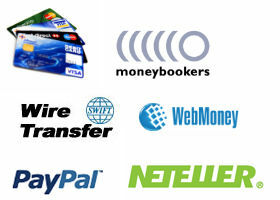 GCI will immediately add $250 extra to your account, so that it now totals $2,750. The maximum bonus is $5,000. For this you will have to deposit $50,000. 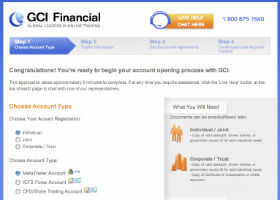 GCI Financial will then add $5,000 to your account, so that it totals $55,000. GCI Financial was founded in 2002 and is regulated by the IFSC in Belize. It has over 10,000 customers worldwide -both individual and corporate- and prides itself on providing excellent market analysis, which is also used by the Financial Times and Reuters and subscribed to by such wellknown banks as J.P. Morgan, HSBC Asset Management and Goldman Sachs. What it comes down to is that GCI Financial is a very professional broker with a good track record, a client friendly attitude and excellent trading instruments.The three trading platforms GCI offers (ICTS Forex, CFD/Share Trading, MetaTrader) are very professional and the spread is competative. But when it comes to their forex bonus we think they could do better. The bonus cannot be withdrawn, period, whereas other brokers have clearing requirements that typically range between 1 and 2 mini lots for every dollar in bonus. Also, the minimum deposit of $2,000 is pretty steep for beginning traders, altough if you're a serious and experienced trader it's not that much. However, if you are simply looking for a good, solid broker that has been around a long time (because as far as online forex is concerned, 2002 was about 150 years ago) you could do a lot worse than GCI Financial. In that case, open an account with them, use their excellent services and simply take their forex bonus as....well, a bonus. 4. Receive Bonus in Your Account!